Discussion in 'Guitars in General' started by Smgbad, Jan 24, 2012. On my local Craigs for $500 w/ case. Never seen this type of SG before though. Ideas? Mid-70's SG Deluxe. For $500 buy it immediately (barring any neck break issues) or let me buy it! Now that I look at it closer it looks like it has the embossed "Gibson" name on the pickup covers, which I think makes it a '72! The first of the famous undesireable (at certain times) early 70's SG's. That looks like a '72, they started making them like that after they discontinued the Angus Young/Robbie Kreiger style SG's, no more full face pickguard and no trapezoid markers. First time I saw one was in King James Music in Brooklyn on Flatbush Ave. in'72. Saw a few of them at the Sam Ash on Coney Island Ave. a few weeks later. I was saddened whan I was told that Gibson no longer made them like the 68-70 models. Denny Laine in Mccartney's Wings played one, got a great tone out of it. I had one and hated it. It sounded great, but played like ****. Weird, thin but deep neck, and the angle is so shallow that the strings would pop off the saddles if I played hard. It did sound really good though. 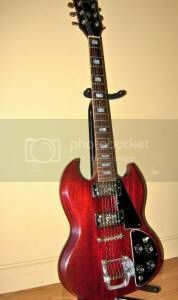 72 Deluxe SG....Make sure that it is not a fake at $500 it is almost to good of a deal to be true..
Its a scam apparently. Another TGP'er has the same pic and ad listed over 1000 miles away on his local CL. "comes with a SG" huh? If that's the case avoid at all costs. Why would anybody fake one of those? The originals aren't worth squat as it is. It's on Seattle's as well. Glad everyone figured out its a scam! You would think they would at least use a real one in a scam photo, that knob layout looks funky to me, and I'm no expert. It's probably a real picture lifted from a legitimate eBay auction or something. Do not EVER buy something long distance on CL unless you are paying with PayPal. I saw this pic in SF bay area Craigslist too !! !